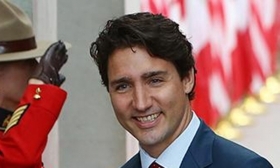 WASHINGTON -- Prime Minister Justin Trudeau will be making one more visit to the United States before the renegotiation of NAFTA begins. He will speak at a meeting of U.S. state governors July 14. A statement issued by Trudeau on Friday suggested the auto sector, and in particular, the supply chain, will be top of mind when he delivers the address. The Rhode Island gathering of the National Governors Association will draw several dozen state governors, as well as U.S. federal officials. Organizers say its two main themes will be technology and trade. The latter is of especially pressing significance: A few days after the meeting, the United States is expected to publish its priorities for a new NAFTA, and talks with Canada and Mexico are expected to begin in about a month. Trudeau's office issued a statement Friday confirming his intention to deliver a keynote speech in Rhode Island on July 14. “No countries share a closer bond than Canada and the United States,” Trudeau's statement said.